How Much Should I Feed My Rottweiler? Are you wondering what and how much your Rottweiler should eat? 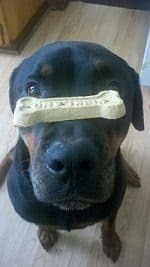 Stick around and we will introduce you to the basic rules of feeding your Rottweiler whatever his age. 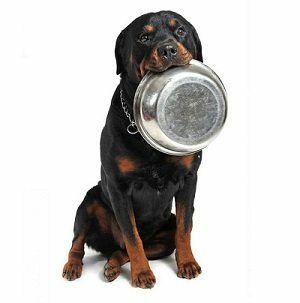 Deciding how much you need to feed your Rottweiler is very important for the health of your dog. Rottweilers are known for being overweight and even obese. Through proper diet and exercise you should be able to manage your dog’s weight safely. Your Rottweiler puppy, while very small at the moment, will grow into a very large dog. A female Rottweiler will grow to weigh around 75 pounds to about 105 pounds. Male Rottweilers can be expected to be a bit larger than a female at around 110 pounds to about 130 pounds. So even though your puppy is small now, it will grow up to be very large. And they grow quickly! Your puppy’s nutrition is incredibly important while they are young so they can grow up to be strong and healthy. They are at risk for developing joint and bone problems, so feeding them highly nutritious food is the key to kick starting your Rottweiler into a long and healthy life. Feeding them dog foods that are holistic, all natural, and organic is a great start. Your puppy, depending on their age, should be fed several times per day. It is important to remember that a new puppy, that has just left his mother will have been able to eat as often as he liked. His tiny stomach needed food, little and often, and for the first few months of his life he will need to be weaned onto larger meals. The type of food that you decide on, for your puppy as he grows, will determine how much he has. When deciding on food type it is vitally important that you also take a look into canine nutrition. To raise a healthy and happy puppy you need to know exactly what is good for him, what foods offer high or low nutritional value and what the ingredients in commercial dog food actually mean. For instance a puppy that is fed a low value food will need more of it whilst a puppy that is eating a highly nutritional meal will need less. Once your Rottweiler has reached it’s full maturity and has finished growing, they should have a regular feeding schedule set in place. It is very important to regulate their food and make certain that they are not being over fed. As your dog grows into adulthood is is a good idea to feed him twice a day. This way you are not allowing him to overfill his stomach and deep chest area with food which can make him bloated. Dogs can develop allergies to certain foods and if your dog is experiencing discomfort, flatulence or itchiness as he grows then certainly do not overlook his diet. These symptoms and many more, inclusive of behavior problems, can be typical signs of bad diet. Even if the food is wrapped up in great marketing and on every supermarket shelf. Along with a regular feeding schedule, you should also make sure you have a regular exercise schedule for your dog too. Exercise is very important part of keeping your Rottweiler’s weight under control. Feed your puppy good quality food that contains meat as the first ingredient and avoid food with grains, by-­products, or meat meal as the first ingredient. Don’t forget to provide your Rottweiler with plenty of exercise to keep them from becoming overweight or obese. Keep your dog’s feeding schedule regular once they are of full maturity. If you think you are feeding your dog too much or too little, consult the back of the bag of food you are feeding them and see how much it calls for based on their weight and adjust accordingly.